Homemade pizza takes very little time to whip up. However, some days you might not have the time or energy to knead up some dough. Maybe you’ll be gone and want to have an easy supper available for your kids or your family might be getting back from a vacation and want something that can be in the oven in minutes. Whatever the reason, sometimes frozen pizzas are convenient. Sure, you could also freeze just pizza dough and some people love it. I’ll be honest, I don’t care for the taste of frozen dough thawed and then baked (plus, you have to plan hours in advance to take it out of the freezer). I’d rather take the time to make it up fresh. Traditional frozen pizzas don’t have the texture of a freshly make one either, but they aren’t supposed to so I’m okay with it. After several experiments with making homemade frozen pizza, this was our favorite method. Don’t forget, you can use these tips for making a pizza frugally on frozen ones too! 2. Preheat your oven to 400 degrees and bake each crust for 5-7 minutes and flip and bake on the other side for 3-5 minutes. (The first time you do this, keep an eye on it! Overcooked crust is not good.) You are not baking it all the way. It will finish baking when you cook it from the freezer. Let cool. 3. Make a batch of sauce. If you are doubling the crust recipe, double this as well. Freeze in individual size portions either in small Tupperware or in mini zipped baggies. Determine this based off of your crust size or how many pizzas you will be baking at a time. 4. Grate cheese and separate into zipped baggies for each pizza. 5. Assemble all of the other toppings – chopped onions, diced bell peppers, chicken, pepperoni etc. I put all of my diced/sliced veggies together into pizza sized portions in baggies and the meat divided into pizza sized portions into another baggie. To ensure your veggies don’t stick together, you can spread them out on a baking sheet and once frozen transfer to the portion sized baggies. Either slide a crust (or however many you know you’d make for a meal) into a zipped baggy and then slide the little bags of sauce, cheese, and toppings into the same bag on top of the crust and freeze. Or place all of your crusts into one bag and all of the sauce, cheese, and toppings into another. Then when it comes time to bake simply pull out the right number of supplies from each bag. 1. Preheat oven (and pizza stone if you have one) to 425 degrees. 2. While oven is preheating, run the frozen sauce under hot water to defrost. 3. Remove your crust from the freezer, spread with sauce, and top with the packets of veggies and cheese. You can do all the prep on one day (perhaps a day you are already making homemade pizza for supper). Double, triple or quadruple the recipe depending on your family size and how many you want (since you are already going to be grating and chopping increasing the amounts you do isn’t going to add that much time). On the day you pull a frozen pizza out of your freezer for supper, you can have it baking in the time it takes to preheat your oven. Doesn’t get much easier than that. This entry was posted in Uncategorized on May 1, 2014 by Deanna Michaels. My husband would live off pizza if he could. I may have to try this. I agree that just pizza crust still takes effort, but this reminds me of little cesears pizza kits. Super easy! Gotta be a whole lot cheaper than frozen pizzas, too. My husband too! Pizza is his favorite food. I love good homemade pizza. Freshly made will always take the cake but this is a good back-up instead of frozen pizzas from the store. I make homemade pizza dough very often, I never thought to freeze it. It will be very helpful if I did, which thanks to you I will be doing from now on. Thank you for sharing with Foodie Friends Friday Party this week. We would love it if you would add a link back on your post. I’ve pinned and shared. Thanks, Joanne, for hosting and pinning! It’s always nice to get a couple of extra meals made when you are in the kitchen. Ooops, so sorry about that. I have a text link to my the page of parties I link up to and I completely forgot to put it on the bottom of the last couple of posts. Thanks for the reminder. I never thought of this. What a great idea for a night when you don’t know what to eat for dinner. Thanks for visiting me! Thanks, Elizabeth! It is so nice to have meal options for those days that are crazy and you run out of time to make dinner. Plus it doesn’t really take much extra time if you do it when you are already making pizza for dinner. My son would love this! Thanks for sharing and linking up again with us at the #WWDParty. Have a wonderful week ahead. 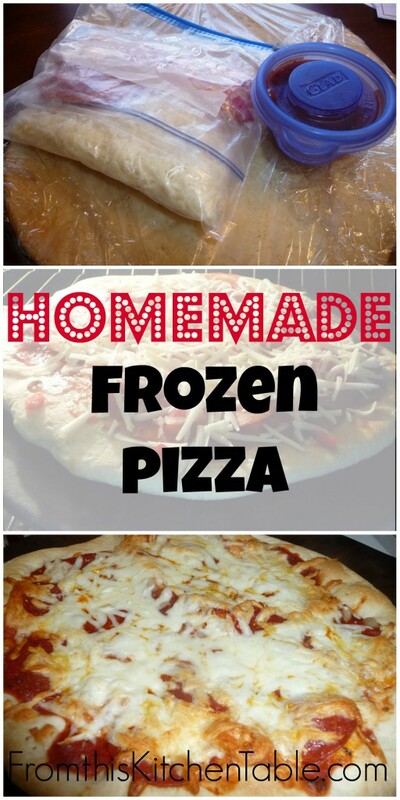 I have always wanted to try making my own frozen pizzas! This is great! Thanks so much for sharing the best way to do it! Okay seriously Deanna do you listen to the conversations at my house?! LOL! My hubby and I were just talking about experimenting with our GF pizza crusts and freezing them last week. We decided to try freezing the dough this week but we both really want to try baking the pizza crusts and freezing them too. Now that you have given me the steps you use I’m not so afraid of trying it. lol! How funny! I’m curious to hear how the gluten free dough does frozen. I’m frozen wheat dough before and have never been super happy with it but I know other people that do it all the time. Having the crusts baked makes the pizzas come together super fast. That looks awesome, frugal and healthy! Thanks, Helene! It was super easy and budget friendly! Thanks for all the ideas! I love making homemade pizza, so this will have to be the next step. I hadn’t thought about precooking the crust AND flipping it. And I love that you have directions that incorporate using a pizza stone. Isn’t homemade pizza the best?! We love it and the pizza stone gives it such a good texture. I agree. I love being able to switch the sauces and toppings around so easily. Love the post. I found it from the Seasoned Homemaker links! I freeze parbaked pizza crusts for the summer to cook on the grill. We don’t have air conditioning, so I do not turn my oven on when it is hot. But the prebaked pizza crusts work well on the grill. Thanks, Betsy! Anything that can help save time in the kitchen helps. We have air but I try to keep it up pretty high. We are in OK and the summers can get pretty brutal. Love grilled pizza. They have such a good flavor. I’m just getting into the frozen meals, and I love them. Pizza is a favorite at our house, and this will save us so much money! I’m glad I found your post through the Titus 2 Tuesday link party. It’s so nice to have a back up meal or two in the freezer for when life gets crazy! We love pizza too – nothing will beat a freshly made homemade pizza but these are pretty tasty convenience food. Thanks for stopping by. My husband is a frozen pizza junky. He just bought 5 to stick in the freezer because they were on “sale.” I am very sick of the frozen pizza for lunch idea, and this way sounds so much better! Thanks for sharing. Lol! That is too funny. I guess easy and cheap is hard to pass up. I agree, they do sound way better and you could do some fun toppings on them. Thanks for stopping by. Hi there! This pizza looks great! just wanted you to know that you’re being featured tonight at the Weekend Wind-Down Link Party! Thanks for linking up with us! Thanks so much for the feature and for hosting, Danielle! I appreciate it a bunch. Have a great week.